Cesare Barontini-designed Vauen makes for a striking take on both the Apple, and the "sitter" pipe. The shape is surprisingly easy in hand, the projecting pedestal being positioned in quite an unobtrusive way. 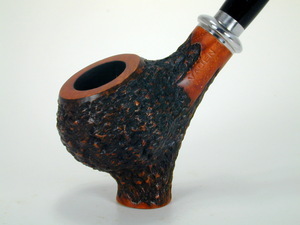 Rusticated finish. Acrilic stem with silver trim. L = 5.5 in./14.0 cm. H = 2.25 in. / 5.7 cm. Depth = 1.3 in. / 3.4 cm. W = 1.8 in. / 4.5 cm. Weight = 1.9 oz. / 55 g.
Wood grain of bowl may be different from pipe pictured.